Image Credit: Wikicommons / J.O. Can India Protect its Coasts? India’s government has failed to ensure that the country’s coasts are properly protected. A new mindset is needed. In a recent statement to parliament, the Home Affairs Ministry stated that threats to major coastal cities from pan-Islamist terrorist outfits continue to exit, but added that the government is prepared to respond to such threats. Still, doubts about the robustness of India’s coastal security mechanism continue to linger, doubts that have been proven justified by a series of events off the Mumbai coast in the last few months. On June 12, cargo ship M V Wisdom, which was en route to Alang in Gujarat, drifted towards the Mumbai coast after breaking its tug and eventually became stranded in Juhu beach. This incident was followed by another involving a Panama flagged ship, M V Pavit, which ran aground near Juhu beach on July 30 after having been abandoned by its crew a month earlier, near Oman. The most worrisome part in this episode was the fact that the ship drifted in Indian territorial waters for nearly 100 hours and remained undetected by the navy, the coast guard and the coastal police – the three agencies entrusted with responsibility for coastal security. On August 4, yet another Panama flagged oil tanker, M V Rak, with 60,000 metric tonnes of coal and 340 tonnes of fuel oil on board, sank off the coast of Mumbai. The sinking ship discharged more than 25 tonnes of oil, a major oil spill that endangered marine life in the area. These incidents of ships running aground, adrift and undetected off the coast of Mumbai have added a new dimension to existing coastal security concerns. Mumbai and its adjoining coastal areas are no strangers to such breaches by anti-national elements, and they have endured the consequences for decades. The most spectacular was the November 26, 2008 terrorist incident, when 10 terrorists from Pakistan landed on Mumbai’s shores and carried out a horrific attack. A similar major terror attack was carried out 15 years earlier, when a series of bomb blasts devastated Mumbai. The explosives used in these blasts were smuggled in via the Raigad coast. In addition, Mumbai and its adjoining coasts have remained a favoured route for large scale smuggling of gold and silver in years gone by, and drugs, arms and explosives in more recent years. The government’s approach to coastal security has always been reactive and top down. Corrective measures have only been undertaken after a major incident, and they’ve been implemented without preparing the environment at the ground level. It was the 1993 serial blasts in Mumbai that highlighted the fact that an inadequately manned and ill-equipped coastguard can’t safeguard the coasts. But instead of addressing the fundamental issue of lack of manpower and inadequate equipment, the Indian government launched a new scheme to cater for the terror challenge. Operation Swan, launched in August 1993 to prevent clandestine landings along the Maharashtra and Gujarat coasts, was a three-layer security arrangement involving the navy, the coast guard and a joint patrolling team drawn from personnel belonging to the navy, coast guard, state police and customs. While the underlying idea appears doable, the fact remains that Operation Swan hasn’t resulted in a single seizure in 18 years. Inadequate attention paid to overcoming the basic problems of coordination, manpower, equipment and motivation among the various concerned agencies at the ground level has been the main reason for this failure. Yet even as Operation Swan was in progress, the Indian government in 2005 launched yet another ambitious project – the Coastal Security Scheme, which involved setting up a series of coastal police stations to strengthen the surveillance infrastructure along the coast. The scheme was, however, a non-starter because the coastal states didn’t display any enthusiasm in implementing the plan as they simply didn’t perceive any threat to their coasts. Despite Mumbai being a preferred target of the terrorists, Maharashtra, too, implemented the scheme in a piecemeal way. Moreover, the decision to set up coastal police stations with a mandate to patrol shallow waters gave the navy an excuse to withdraw from joint patrolling immediately. Thus, coastal defence along Mumbai was weakened, giving the terrorists a chance to strike. 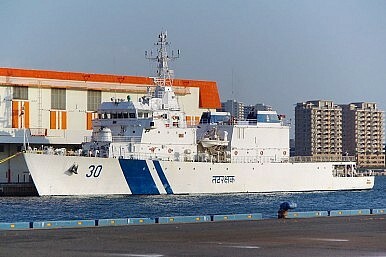 The Mumbai attacks in 2008 compelled the Indian government to take several measures to overhaul the coastal security apparatus, but again it insisted that the navy and the coastguard should pool their resources to guard India’s territorial and coastal waters. It also instructed the state governments to establish coastal police stations and ensure that manpower and interceptor boats were provided to them. Over the last two years, various measures to strengthen coastal security have gradually been implemented. For example, the navy has assumed responsibility for coastal security and has set up four joint operation centres for better coordination. It has also increased surveillance patrols along the coast, and has been conducting several joint coastal security exercises. The coastguard, likewise, has set up five coastguard stations along with a regional and a divisional headquarters, and is in the process of setting up four more stations. It has also inducted several offshore patrol vessels that have helped in stepping up patrolling along the coasts and territorial waters. Similarly, under the coastal security scheme, 72 coastal police stations have been operationalized, and an additional 154 police stations are in the process of being established. However, incidents of ships drifting into the country’s territorial waters undetected raise questions about the effectiveness of all these measures. Here, it’s important to reiterate that the problem lies not in the measures adopted, but in the inadequate attention paid to the functioning of the system at the ground level where the actual action takes place. For example, a series of coastal police stations have been operationalized, with some having adequate manpower and interceptor boats. Still, these police stations have been unable to function effectively, something that was evident during the MV Pavit incident. There are reasons for such failures. First, insufficient attention has been paid to providing these police stations with essential requirements such as proper training for their personnel for sea operations and adequate fuel and funds for the running and maintenance of the boats and buildings for police stations. Second, the respective jurisdictions of the coastal police stations haven’t been communicated clearly to the personnel on the ground, leading to widespread confusion. Third, information sharing and coordination between the marine police, coastguard and navy remain a problem. At present, whatever coordination or information sharing takes place between the three agencies is largely based on personal rapport between the concerned officers. But this rapport has to be institutionalised. Ultimately, if India’s coastal security is to be made stronger, it’s essential that police forces in the coastal states shed their land centric outlook and turn their attention to coastal security duties as well. Pushpita Das is Associate Fellow at the Institute for Defence Studies and Analyses (www.idsa.in) in New Delhi. This is an edited and abridged version of an article that was originally published by the organization here. $10 m Bounty on Mumbai "Planner"
The United States places a $10 million bounty on Pakistan-based terrors suspect Hafiz Mohammad Saeed.